If you are interested in a beautiful new patio in Staten Island, Brooklyn or Manhattan in NY, or in Central or Northern NJ, Advanced Site Contractors is the place to call! For over 25 years, we have been designing and installing eye-catching patios that are as durable and functional as they are attractive and value-enhancing. Patio design and installation is one of the cornerstones of our business and we treat each and every patio construction project as if it were our own property. 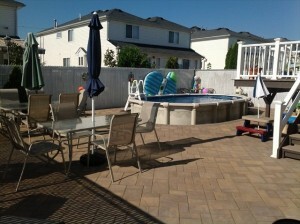 We are experts at installing brick patio pavers, as well as a variety of concrete products, including concrete pavers. In addition to traditional backyard patios, we also install pool patios, raised patios and multi-tiered patios. Our experienced patio contractors handle all aspects of the project and we do not sub-contract out any portion of the work. That means that you can rest assured that the quality you expect from us is the quality you will get. We provide custom patio design, working hand-in-hand with you to assess your expectations and goals, including discussing factors such as location, size, material choice and budget. We can coordinate other aspects of your landscaping to flow seamlessly with your patio design, including constructing walkways, installing water features and designing landscaping features and lighting to turn your backyard into an oasis you can enjoy with family and friends. For more information about our premier residential and commercial patio design and construction services in Staten Island, Brooklyn, Manhattan, Northern NJ or Central NJ, call us today at (718) 984-7483. If you prefer, you can contact us by filling out the form on the side of this page and we will get back to you.